The Sino-Tibetan languages form a putative language family composed of Chinese and the Tibeto-Burman languages、including some 250 languages of East Asia. They are second only to the Indo-European languages in terms of their number of speakers. Many of the better known Sino-Tibetan languages are tonal. However、tone may evolve quickly and is often an areal feature、and thus poor evidence for a genealogical relationship. For example、while standard Lhasa Tibetan is tonal、other Tibetan dialects are not、and several reconstructions of Old Chinese do not require tone: Chinese and Tibetan tones appear to have developed during historical times to compensate for the loss of consonantal distinctions. A few scholars、most prominently Christopher Beckwith and Roy A. Miller、argue that Chinese is not related to Tibeto-Burman. They point to an absence of regular sound correspondences、an absence of reconstructable shared morphology、 and evidence that much shared lexical material has been borrowed from Chinese into Tibeto-Burman. In opposition to this view、scholars in favor of the Sino-Tibetan hypothesis such as W. South Coblin、Graham Thurgood、James Matisoff、and Gong Hwang-cherng have argued that there are some regular correspondences. The genetic relationship of the hypothetical Sino-Tibetan family thus remains disputed. Since both proponents and opponents of the hypothesis agree that it is not as well demonstrated as that of the Indo-European family、and in fact a convincing reconstruction of Proto-Sino-Tibetan has never been proposed、it remains to be shown that Sino-Tibetan is a valid family. Despite the serious problems with it、Sino-Tibetan continues to be very strongly supported by its proponents、and accordingly it is widely accepted without question by non-specialists. The other tonal language families of East Asia、Tai-Kadai and Hmong-Mien、are sometimes included in Sino-Tibetan. This view fell out of favor in the West in the mid twentieth century、with the similarities credited to borrowings and areal features、but it is still widely held in China. Not all of the "branches" of Matisoff's classification are intended as genealogic nodes. For example、Matisoff makes no claim that the families in the Kamarupan or Himalayish branches have a special relationship to one another other than a geographic one. They are intended rather as categories of convenience pending more detailed comparative work. Like Matisoff、George van Driem acknowledges that the relationships of the "Kuki-Naga" languages (Kuki、Mizo、Meitei、etc. )、both amongst each other and to the other Tibeto-Burman languages、remain unclear. However、rather than placing them in a geographic grouping、as Matisoff does、van Driem leaves them unclassified. Certain linguists、most notably van Driem、have proposed that Chinese owes its traditional privileged place in the Matisoffian classification to cultural rather than linguistic criteria、much as Semitic was once considered a primary branch of a "Hamito-Semitic" family; and just as Semitic was later demoted to a sub-branch of Afro-Asiatic、several recent classifications have demoted Chinese to a sub-branch of Tibeto-Burman. it is hard not to suspect that Chinese does not have the distinct status accorded it by the Matisoffian model、but whatever evidence exists for other schemas has failed to win significant assent from the scholarly community. The second major issue is the status of the problematic 『remnant』 languages of the Himalaya、Gongduk、Magaric and others. Either these are early branchings from the Sino-Tibetan tree or they are 『Kusundic』、remnants of earlier language phyla that have been Sino-Tibetanised. The essential part of this model is called the Sino-Bodic hypothesis、for it proposes that the closest relatives of Chinese are the Bodic languages such as Tibetan. Advocates of the Sino-Bodic hypothesis point to two main pieces of evidence establishing a special relationship between Sinitic and Bodic、and thus placing Chinese within the Tibeto-Burman family. First、there are a number of parallels between the morphology of Old Chinese and the modern Bodic languages. Second、there is an impressive body of lexical cognates between the Chinese and Bodic languages. Opponents of the Sino-Bodic hypothesis present two rebuttals. First、they note that the existence of shared lexical material only serves to establish an absolute relationship between two linguistic groups、not their relative relationship to one another. 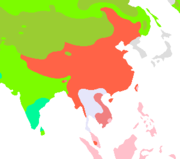 While it is true that some of the cognate sets presented by supporters of the Sino-Bodic hypothesis are confined to Chinese and Bodic、many others are found in Tibeto-Burman languages generally and thus do not serve as evidence for a special relationship between Chinese and Bodic. Second is the reconstruction of Proto-Tibeto-Burman produced by Benedict and refined by later scholars. This was largely based on data from literary Tibetan、literary Burmese、Mizo (Lushai)、and Jingpho (Kachin). From the reconstructed forms、reflexes in each of these and many other Tibeto-Burman languages may be derived by the application of regular sound laws. If Chinese had an especially close relationship to Bodic、and therefore to literary Tibetan、any reconstruction that accounted properly for both Tibetan and languages outside of Bodic (such as Mizo and Jingpho) should be able to account for Chinese as well; however、Chinese forms may not be derived from these reconstructions through regular sound laws. Thus Sino-Bodic is not supported as a group distinct from Sino-Tibetan in this view. Mother Tongue newsletter description of van Driem's proposed reordering of the Sino-Tibetan language group into a new Tibeto-Burman classification. This page was last modified 16:14、23 November 2006.